One of the most common items in your wardrobe is the simple jumper. It could be plain and unassuming, or it could be your go-to item when you need to add a stylish layer to whatever you’ve decided to wear today. Either way, there’s a lot more to the humble jumper than you might realise. This blog will be your essential jumper guide, helping you to identify which style is most suited to you, as well as guiding you through the materials and colours best suited to you. - You should always be looking out for the comfort and fit of your jumper first; as it is primarily a casual piece of clothing comfort is very high on the priority list. If it pulls in the shoulders go a size bigger, but you don’t want to look bulky so make sure you try it on before you buy it. - If you thought there was just one style of jumper then you are sadly mistaken. Styles vary massively, from the simple round neck jumper (or a crew neck sweater), to a button down cardigan, from fine knit jumpers to thick cable knit ones. - Crew neck jumpers can have the unfortunate side effect of making your face seem rounder, so if this is something you are conscious of, a v-neck jumper can help to balance your features. These are both excellent choices for layering when the weather is cold as they look great with a collared shirt underneath. - For a more relaxed style, a cardigan is definitely a stylish choice, but before you buy it, try it on as it’s imperative to get the fit right here. The risk of looking like an old man is high, unless you get one fitted to your body shape, and when wearing it, always leave the bottom button undone. - Chunky or cable knit jumpers might remind you of something your granny gave you for Christmas one year but these have made a massive comeback in recent years, and are now widely available in colours and knit patterns. This jumper style is easy for most men to pull off and is a must for when the temperature drops. 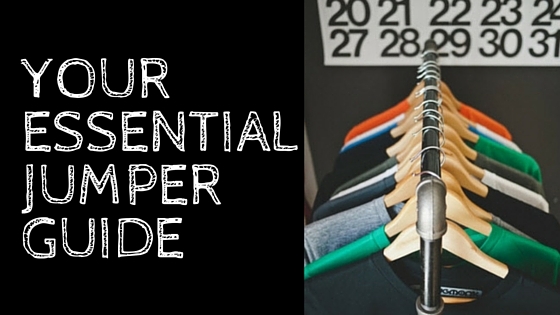 - The essential jumper guide dictates that materials and fabric are really down to personal choice! The same rules apply here as they would to other pieces in your wardrobe – dark colours are better for helping to slim you down, and if you are drawn to prints and patterns, remember to proportion them to your body. Smaller, thinner men should opt for smaller prints and patterns, otherwise it can look overwhelming and make the jumper appear bigger than you! - For materials, simple cotton is a common choice, or wool for colder climates. The best thing to look for is natural fabrics, as these will allow your body to breathe when you wear them. Leave the cashmere to the ladies though!